REALTREE Indoors Max-4 Camo Baby Crib Bedding Set (7 Pieces) Set includes: Comforter, 3 PC Set (Bumper Pad, Headboard Cover, and Fitted Sheet), 2 PC Set (Fitted Sheet and Pillow Case), and Camo Bedskirt. 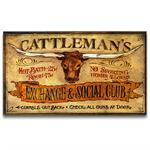 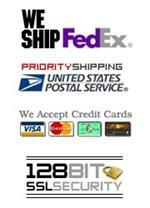 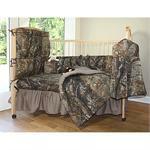 28"W x 18"H Headboard Cover, 160"W x 10 1/2"H Bumper Pad and (2) 28"W x 53"L Fitted Sheets. 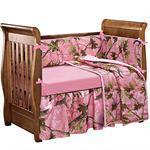 Bedskirt measures 28"W x 53"L with an 11" drop, Comforter measures 36"W x 48"L. All machine washable. 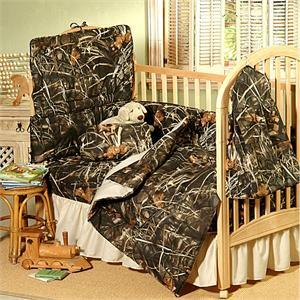 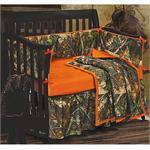 Be sure to check out our other REALTREE Indoors Max-4 Camo Baby Crib Bedding accessories. 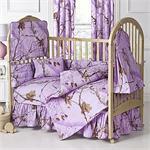 This All Purpose camo pattern with a Lavender background is an 7pc set.